On so many occasions we end up feeling not so hungry for dinner or lunch..It may be due to too much of snacks or untimely food intake or ill health. Also, you may want to have a light meal in case u feel a heavy one would make you drowsy or you have something interesting to eat and feel your regular lunch/dinner would not let you enjoy it. Share with us what would you like to have during such situations - a soup, salad, some juice, sandwiches or anything that you feel will keep you light. to easycrafts@gmail.com by 31st October '09. I will pick up the picture from your blog...you neednt send it. The roundup would be published during the first week of November. you are sure to be getting hundreds of entries. Will try to send mine too. Happy hosting! Hey thats a wonderful theme...will try to send something...happy hosting. It's surely a very good idea. 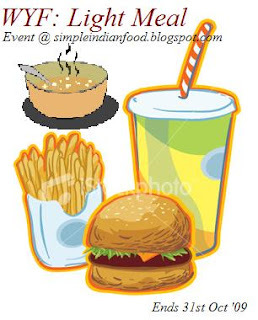 I especially look for light meal ideas for dinner after having a heavy lunch buffet in the Indian restaurants. I will send my entry. Will send my entries, lovely theme again EC. Hi wondeful page and wonderful concept. have sent you my entry. HAppy Hosting and a great Diwali to you. Hello ! I have sent you my entry to this event. First time here....perfect idea, b'coz atleast once in a weekend my family needs this kind of dinner....soups... that's what we do when we eat lunch or i should call it lunchinner (lunch+ dinner) at 4'o clock in the eve.....will definately send something.....also looking forward for more ideas at the roundup. My last minute entry is waiting for you in my blog!!! Can I see the event entries in your blog?